we are glad to announce that on May 3-5, 2013 in the beautiful city of Kyiv (Ukraine) the Fifth Anniversary International Debate Tournament KYIV OPEN will take place, held by All-Ukrainian Youth NGO “Debate Academy” and supported by Foundation "Open Society Institute". If wars are born in the minds of humans, they have to invent how to preserve peace. for the third millennium society. Terrorism, discrimination, xenophobia, racism and war conflicts – all these phenomena need reconsideration. We all consider ourselves part of humanity but how humane are we? The Tournament is held in British Parliamentary style. Participants are provided with accommodation, food and transfer round our beautiful city. We insist on N-1 rule and welcome independent adjudicators! Michael Shapira, Israel: ESL Champion, Worlds 2011\12, CA at Red Sea Open 2012, DCA at UCU Open 2012. Leela Koenig, the Netherlands: Euros and Worlds ESL finalist, Worlds and twice Euros best ESL speaker, EUDC breaking judge. Crt Podlogar, Slovenia: Belgrade Open 2011 champion, Athens Open 2011 & IDAS 2010 finalist. During the Tournament participants will face 4 preliminary, semi-final and final rounds, debate parties with some r-r-real surprise; have an opportunity to communicate with extraordinary people; and feel the unique atmosphere of one of the oldest cities of Europe. The participants will be offered exhibitions, master-classes, discussions and interactive workshops on the general subject area of the event. As usually practised during the last years, there will be invited the representatives of the UN and Human Rights NGOs to hold introductory lectures and share info-slides on the problematic area of the tournament. Registration is open till March 31, 20013. 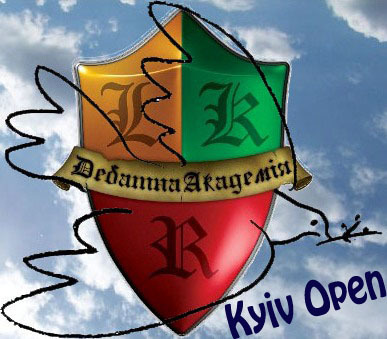 If you have any questions feel free to contact us on KyivOpen@gmail.com.